Since the dawn of humanity, man has always dreamed of flying, just like birds do. But few people know that this passion has even led to the creation of a human powered helicopter. We are talking about Atlas, the prototype that in 2013 won first prize at the Igor I. Sikorsky Human Powered Helicopter Competition, flying for 64 seconds to a height of 3.3 meters. 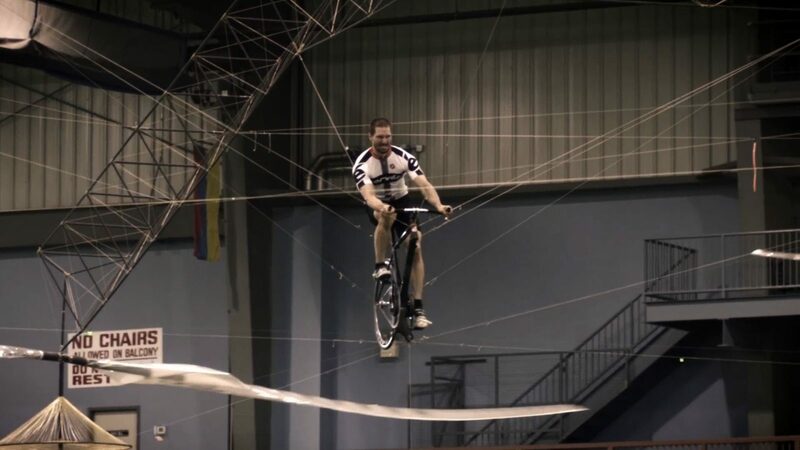 It’s called Eta Speedbike, and is the fastest human-powered vehicle in the world. The shape, reminiscent of a bullet (or something else, if you prefer) does not mislead: in 2015 it pulverized all the previous speed records, reaching the outstanding speed of 139.45 km/hr! Made of carbon fiber, it is completely devoted to aerodynamics: even the external view is provided by small cameras, instead of the usual window. With a maximum speed of 34km /h, it is the fastest human power water vehicle of the world. There are two variants: the Aqua Skipper (built in 2004) is powered with an alternate movement upwards and downwards, and the Waterbike, a real bicycle to “ride on water” . Its name is Daedalus and was created by MIT in collaboration with NASA, in 1988. Although many years has passed, it still holds many records, including the more durable flight and longest distance travelled by a human powered aircraft. In 1988, it successfully covered 115 km in 3 hours and 54 minutes, at an average speed of over 29 km/h. From flight to water jumps, but the simple human power can also bring us into the abyss. This is the case of Omer, a submarine developed by a team of Canadian students that can travel underwater at 4.6 knots (8.6 km/h).